The Trivium returns for its fifth year Sunday, Nov. 11, at Mustang Stadium, 2101 Mustang Drive in Marble Falls. Races start at 7 a.m. and later, depending on distances, with courses winding through the surrounding Hill Country. Admittedly, even the shortest course of 10 kilometers (just over 6 miles) might be a bit long for someone not used to running long distances, but it’s a goal you can work toward. To make it easier, bring a friend for support, take breaks, and walk some sections. If you’re still hesitant about taking on a long-distance race, the Hill Country Trivium also includes the Phoenix Family Fun Run, a 1-mile event, starting at 9:30 a.m. the same day. It’s a free, untimed run (or jog or walk) looping around a dirt road adjacent to the stadium. The fun run supports Phoenix Center of Marble Falls, an organization that provides high-quality mental health care to Highland Lakes children and families. Go to phoenixcentertexas.org to learn more. The fun run is great opportunity for a family to come out and walk (or run) the course together. Quinn and Tejas Trails create an upbeat atmosphere at all running events. Medals and awards for top finishers in each category are created from artwork by youths in the Phoenix Center art therapy program. 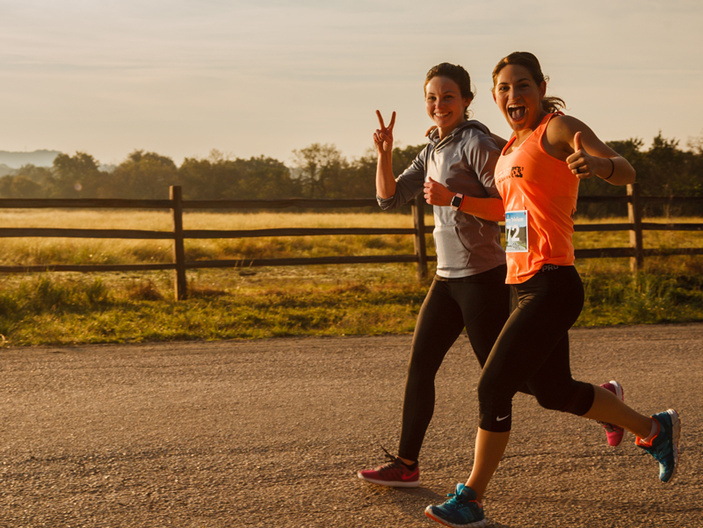 You don’t have to register and run to see what the Hill Country Trivium is all about. You can just swing by for a few minutes and check out the event to learn more. Then, maybe start thinking about participating in next year’s Trivium. Go to tejastrails.com to register or for more information on other events. Families who want to run more together can also register for the Mosaic, a community event on Saturday, Dec. 1, at Indian Mound Ranch, 12805 Texas 29 in Liberty Hill. Go to tejastrails.com for more. The Mosaic features 1- and 2-mile family runs as well as 5K through marathon distances.